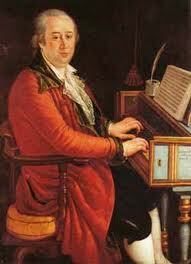 This little performed two act intermezzo, a wonderfully droll comedy, was Cimarosa’s first success. The translation was commissioned by the Buxton Festival for what was claimed to be the British premiere – though a hybrid version opened in London during Cimarosa’s lifetime, at the Kings Theatre, Haymarket on 15 January 1788. The Buxton production, directed by Jamie Hayes, opened on 9 August 1989. The cast included Susan Bullock, Christopher Gillett, Steven Page and Andrew Shore. The piece is full of lively music and comic situations; it’s curious that it isn’t revived more often. Always fighting fills the papers. all they write about is fighting. that’s what I would rather read. it’s so hot I cannot drink it. That’s the life I’d rather lead.